Residents of Mbeere South in Embu County were left shocked after a middle-aged woman allegedly set her love rival on fire. According to reports, the suspect accused the victim of having an affair with her husband who is a businessman in Mutuobare market. 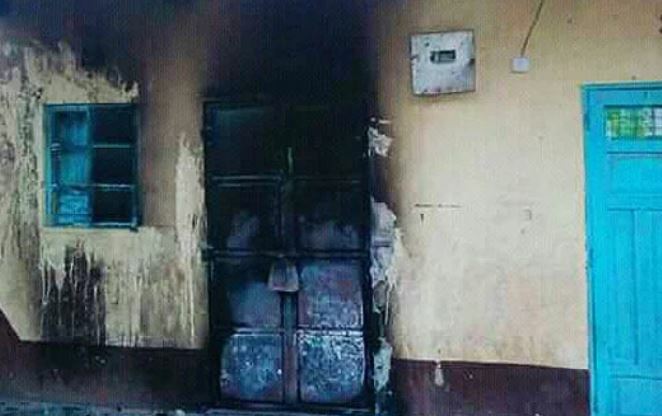 She is said to have gone to the home of her rival, Hellen Mwingi Kariuki on Monday night before breaking a window, dousing the house with an inflammable liquid, and setting it ablaze. Ms Kariuki was rescued by members of public after staggering out of the house in flames and collapsing outside. She sustained serious injuries and is fighting for her life at the Kenyatta National Hospital. She was first rushed to Embu Children’s Hospital, Tenri before being transferred to Karira Mission hospital in the neighbouring Kirinyaga county. Her condition deteriorated and medics referred her to Kenyatta National Hospital. Confirming the incident, Mbeere South police boss Ahmed Mohammed said police have arrested the suspect. “She (the victim) had a romantic relationship with the suspect’s husband. We have arrested her (the suspect) to assist with investigations,” he said. “The arsonist had doused a rag and several papers with an inflammable substance. The substance also appears to have been poured on the ground, and since she (victim) slept on the floor, it was soaked in the mattresses,” said Kiambere MCA Lenny Mwaniki.